We only stayed one night at the Emerald Palace Casino and resort in the Vaal River in December. 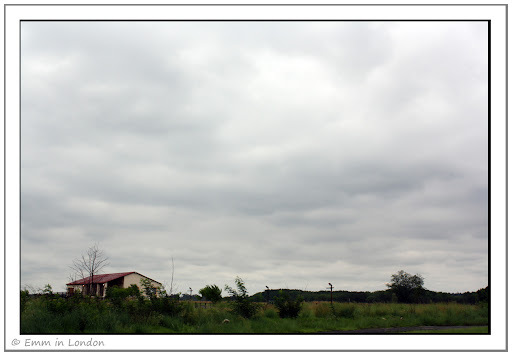 After the brilliant African sunset of the previous evening, we woke up to a typical, cloudy summer’s morning. In the summer months in Johannesburg and the province of Gauteng, it is the rainy season and all of that beautiful greenery you see in the photo above is courtesy of the incessant rain! 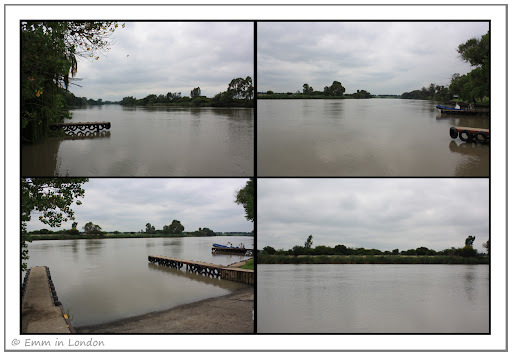 If you enlarge the photo above (by clicking on it) you can just make out the Vaal River winding past the boat house. It didn’t look to bad from our vantage point up in the hills but the Vaal River was filled to capacity in December. Just before Christmas, news had broken that the Vaal Dam was overflowing and that it was 101% full with four sluice gates open. Well, by the time this photo was taken on 27 December, it was more like 110% and all five sluice gates were open. 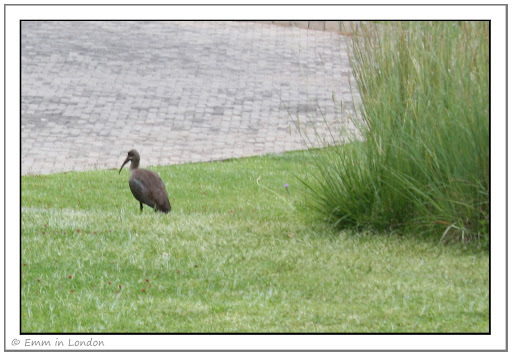 Being of a daring nature, we decided to walk on down to the river and spot this hadeda (a kind of ibis). Hadedas are known for their obnoxious and loud cries as they fly over people’s houses at 4am in the morning and they also lay their eggs in the most inconvenient of places. It was both thrilling and frightening to see the Vaal River this full. It hadn’t burst its banks at that stage but it is certainly not safe to play any water sports on the river or the dam when it is in this state. Of course, my four-and-a-half-year-old godchild is infinitely braver than I am and she took a nice walk right along the bank while I got dizzy and sea-sick. This is one of my favourite photos of all time and I might print it out and frame it. There is just something so South African about this scene. I could have focused more on the house and brought it down to a third of the picture but then you wouldn’t be able to see just how much sky there is in Johannesburg. Well, this homesick meisiekind is going to make some nice English tea and watch some nice American tea and glare at the not-so-nice cold weather outside. That reminds me. The major difference between English and South African cloudy weather and rain? It is cold in England! What a shock that was to my system to not see steam rising up from the pavement when it rained! There is something rather spectacular abvout southern hemisphere skies. Yous is fabulous. I know why you like it. The "rule of thirds" is sometimes meant to be broken 8-). Very dramatic emphasis on the sky in that last shot! I think it's not until you get very close to flood water that you really appreciate its power. I've been close once and it was frightening. @ Ash: yup. That was taken down below the chalets. It would not be safe to stay any closer to the river. @ Daria: hiya! Welcome to my blog. 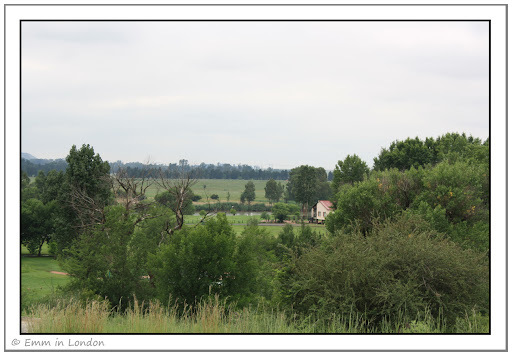 South Africa is full of different vistas, landscapes and climates too. It is a wonderful place to travel. @ Mo: aaah, a kindred spirit. It is certainly a Southern Hemisphere thing! @ Kathy: I like how you put that! Thank you! @ Betty: thank you! Glad you liked the last one too. @ Sheila: definitely. It was exhilarating and although we were permitted to go down to the water's edge, it was risky. I love the Johannesburg sky! Thanks for sharing. Hi Emm, great to see you again. Great post, yes while the Transvaal is over flowing with water, the eastern cape is bone dry, our dams are almost empty, so we are in dire need of a flood, to replenish our water supply. Sounds very dramatic, but it is the only thing that can save us. Thanks for following me on GF, glad to have you on board. Enjoy your weekend. @ The Astral Cowboy: The sky in much of South Africa looks like that. It is fabulous. @ sexylegsandbody: Aaaah, that is a pity. Droughts are so severe and they often lead to fires, which is devastating!